Today, we keep on hearing about the advancements in solar technology. It is now easier to install a solar system than in the past. Given the fact that the efficiency of solar panels has largely improved, many individuals and industries alike have chosen to go solar in order to reduce their power bills. However, people are often bogged down by the high prices of the solar system. In order to overcome this restriction, many companies and scientists are inventing cheaper modes that could enable organizations and individuals to go solar. One of the newest invention in this regard is the origami solar panels. Sounds interesting! 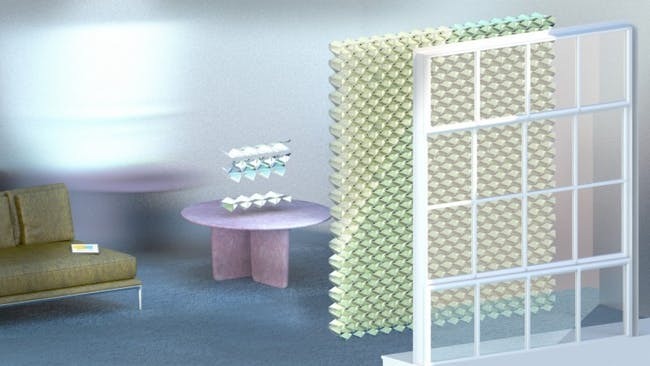 Origami solar panels as the name suggests is like a window blind that generates power using the origami design. The technology uses thin-film solar cells with reflective inks that are folded into a shape measuring 10 centimeters deep. This design also helps the light to enter into the room. It can be used as a blind as well as act as a solar curtain. In today’s modern times, the population of people living in apartments has largely increased. The Origami Solar Panels could be a good way for renters or even homeowners to try and test solar technology. It will be more economical and could help millions of people living in apartment buildings. The origami-style solar panels are capable of generating more electricity as light reflects against the folds of the panel. The origami shape makes it possible to bounce light between multiple solar panels, generating more power. These panels are made by printing thin film solar cells onto a plastic backing, cutting out the design, and then folding it into the origami shape. It all started with Building-integrated photovoltaics (BIPV) which integrates photovoltaic modules into the building envelope such as roofs and windows. The major advantage of BIPV over normal standard PV panels is that they integrate into the buildings instead of sticking out. However, BIPV products are most useful in the construction of new buildings as an ancillary source of electrical power. This shortfall can be avoided if using modern and lighter versions of solar panels such as the origami solar panels.